I had always been a keen aviation enthusiast from an early age. I was very lucky as a child in having parents that encouraged my hobbies and interests. 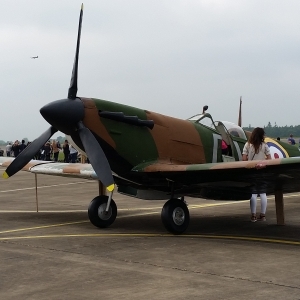 A stable diet of all sorts of Airfix models and of course the Spitfire were built in many scales. I started with the simpler models before moving onto the larger and more complex offerings. 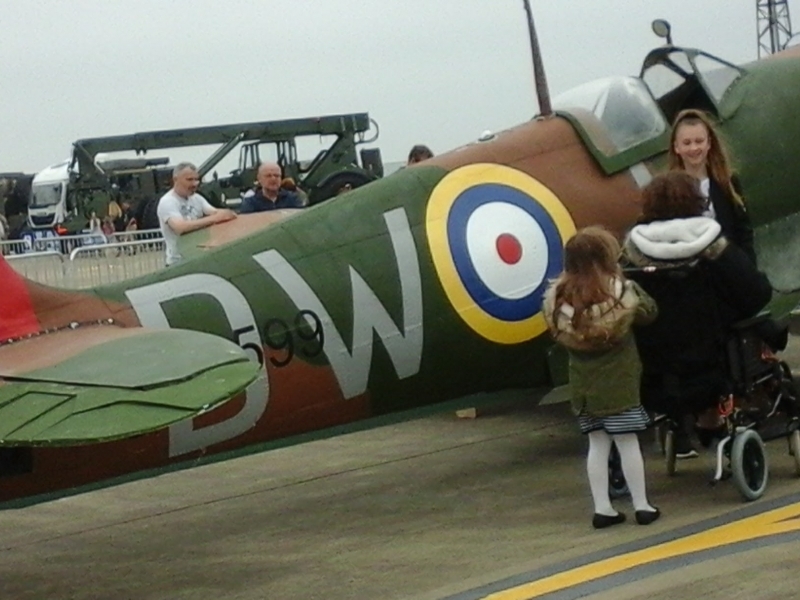 The 1/24 Spitfire was the best, with it's rubber tyres and moving parts. The big change from plastic models came when my father made a glider. The model was made from balsa strips and covered in tissue. After much anticipation we were ready for the first flight. We lived opposite a field a natural place for a test flight, however we decided to try a test flight in the front garden. The glider flew straight and true, caught a thermal and flew over our house and nestled beautifully in a neighbours fish pond. It sadly broke in two and that's where the hobby of aeromodelling ended for my father. However I was hooked and I started to buy magazines that had free flying aeroplane plans and started to make them. I started off with gliders, before moving onto rubber powered models and finally radio control models. I didn't limit myself to aeroplanes and made all sorts of model ships, boats and even a submarine. In 2011, I was made redundant. A life changing moment and not something I was used to and with it comes boredom. I just needed something cheap to do to to fill my time. It was my brother in law who suggested that if I made a model like a Spitfire, or a Hurricane it might create a job, as job hunting wasn't going well. 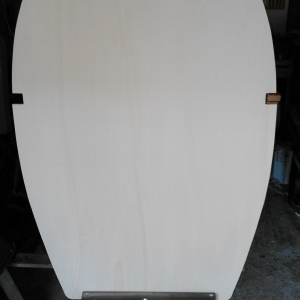 He reasoned that if I successfully made a large model, I could exhibit it at events and perhaps make money to supplement my lack of income while looking for work. So, I dug out my old plans and found that I had 1/6 scale MKV Spitfire and a 1/3 scale MkIX in my archives. 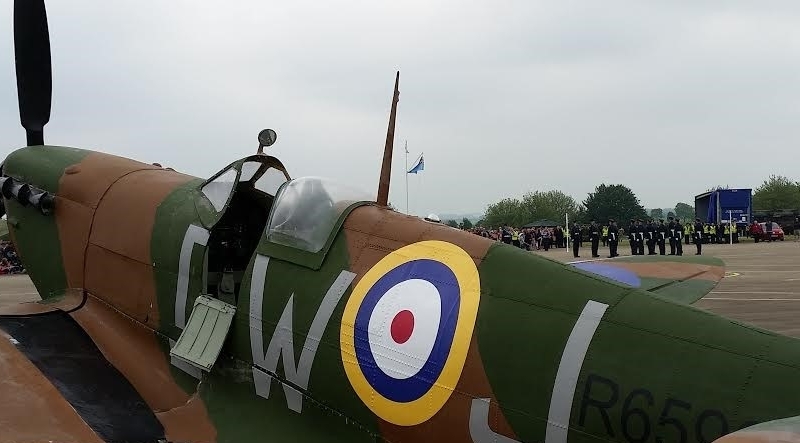 The 1/3 scale Spitfire had a wingspan of 83 inches, so this was going to be big. Now most sensible people at this point would have had a reality check and said this is madness. 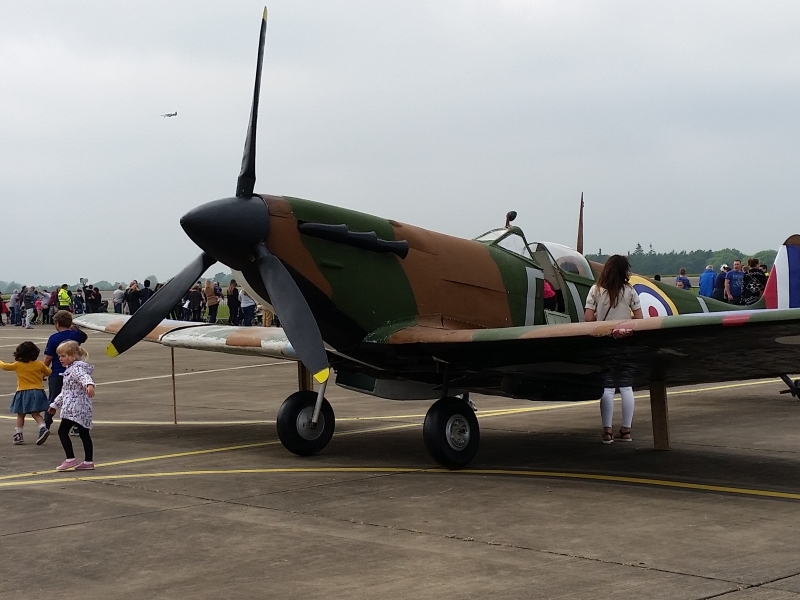 A Spitfire fuselage is thirty foot long, with a wing span of nearly forty foot and original parts are very expensive . 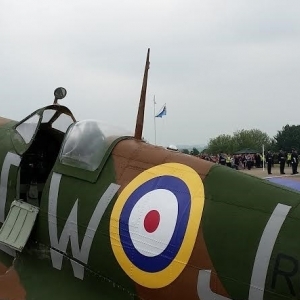 However the initial costs of making the Spitfire would be low. 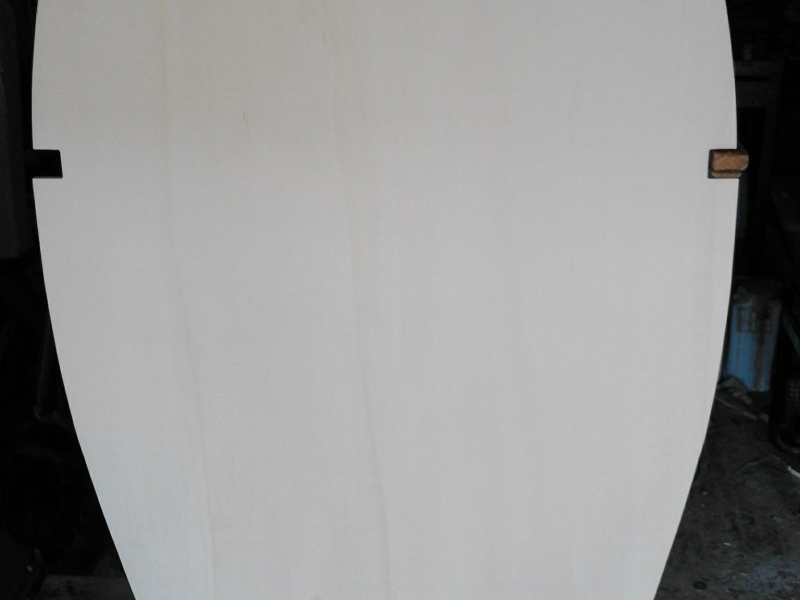 Plywood sheet and basic materials are relatively cheap. Needless to say the radio control drawings, while fit for purpose for that application, were not going to be good enough in themselves to build the Spitfire. So blue prints and general arrangement drawings were purchased and now my book shelf is full of Spitfire books and publications to help me on my way. 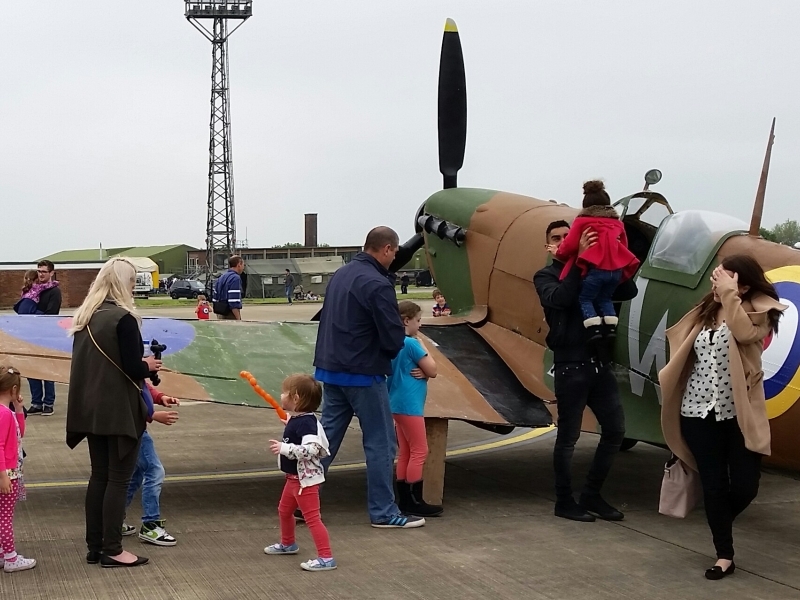 Books included Spitfires and Polished Metal, Spitfire Engineered MKIX and MKXVI, Spitfire Workshop Manual and the Supermarine Spitfire Restoration Manual as well as many others. The final frontier for Spock and company, but I had a single garage. Better than nothing and in the early stages it fitted the bill perfectly. 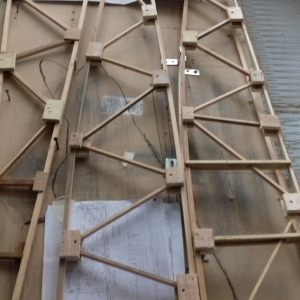 The fuselage frames were then marked on the plywood and cut out until I had a reasonable number to assemble a basic fuselage. Unfortunately I didn't take many photographs of the fuselage, but I have included what I have got. 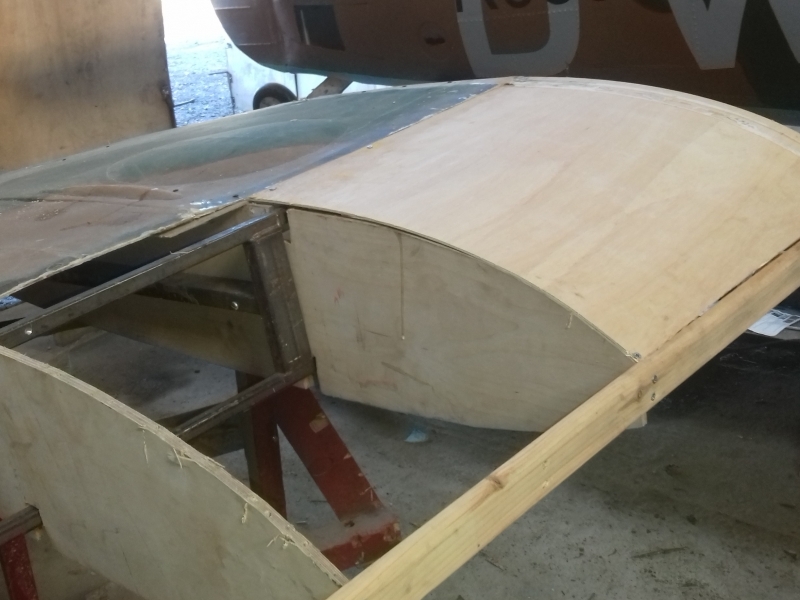 This fuselage was built similar in many ways to the inner structure of the Hurricane and not the Spitfire. 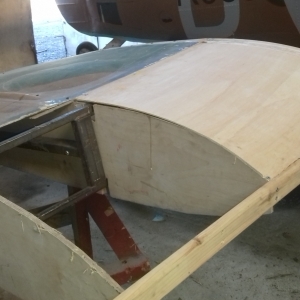 The aircraft has heavy metal sections in the middle of it and the frames have a large centre square section removed and the fuselage formers are mounted in place on them and then covered in fibreglass covered plywood. 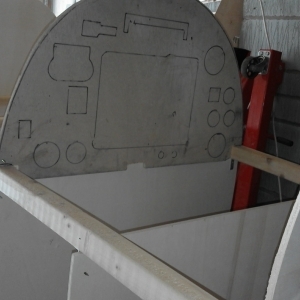 The wings have a metal spars, with plywood formers for the ribs. 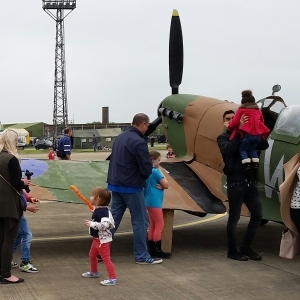 Three years in and the Spitfire was "coming along" as my nephew used to say. However it was moved from in front of the garage where it was half in, half out, to what is our postage stamp of a back garden. 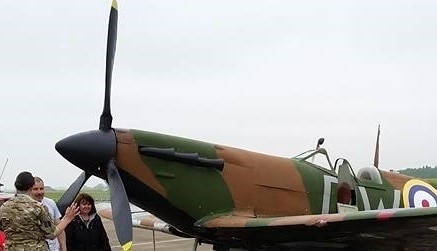 In fact the Spitfire dominated the garden but after working on it in the freezing weather, the Glastonbury mud and everything else inbetween, I scraped together nearly enough money to rent a very basic unit near to where we live. It was storage really, with a gravel floor and no power, but at least it was twenty eight foot square, so big enough. I couldn't get insurance at the unit, but at least the aeroplane had a home. 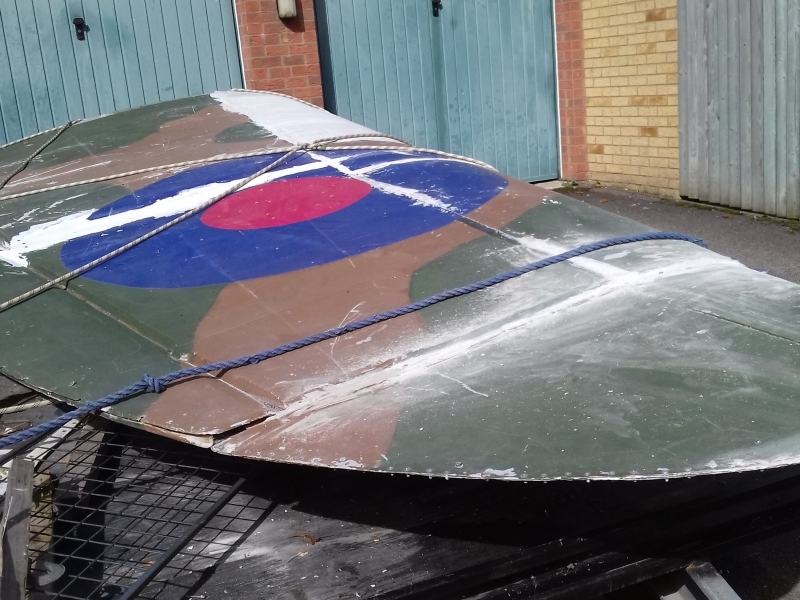 Work continued a pace and while my working conditions and the Spitfire were not perfect it was largely complete as a fuslelage and wings. 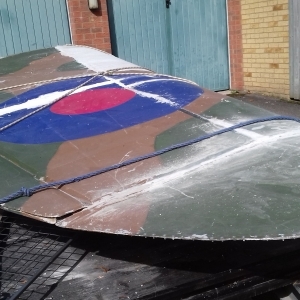 I had previously sold all of my old collectibles, had family donations and with my money invested in some fibreglass items for the propellors, cowlings, exhausts and other items to make it look better. I had chosen this squadron for two reasons. It was the County of Chester Reserve Squadron. Chester isn't far from where I grew up and also quite co-incidentally one of the squadron aircraft had my initials. A little self indulgent, but it was my aeroplane after all. Things were ticking along nicely, with more research being carried out and other parts made, re-made and purchased to make it a better exhibit, but as usual there was a spanner in the works. The unit I had rented for the last three years was in a complex with others, but they were poor in facilities and hopelessly insecure. Inevitably of course in 2017 I had the phone call that I had dreaded. 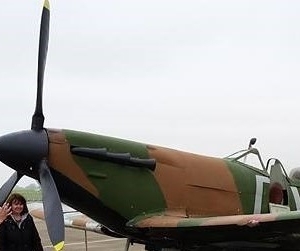 My and every other unit had been broken into and while the Spitfire wasn't seen trundling down the road all of my power tools had been stolen. Naturally In their haste to steal the power tools they knocked and damaged the wings!! I found it very difficult to work on the Spitfire after the break in. We had a pretty much established working routine when it came to Spitfire building. I had managed to get a job and while it wasn't particularly well paid it was an income. So I would drop my wife off at the train station and then go to the unit at 7:30am. Work for an hour, or so and then come home and get ready for work. In the Spring/Summer months I would then go back to the unit in the evening to work for a little longer. 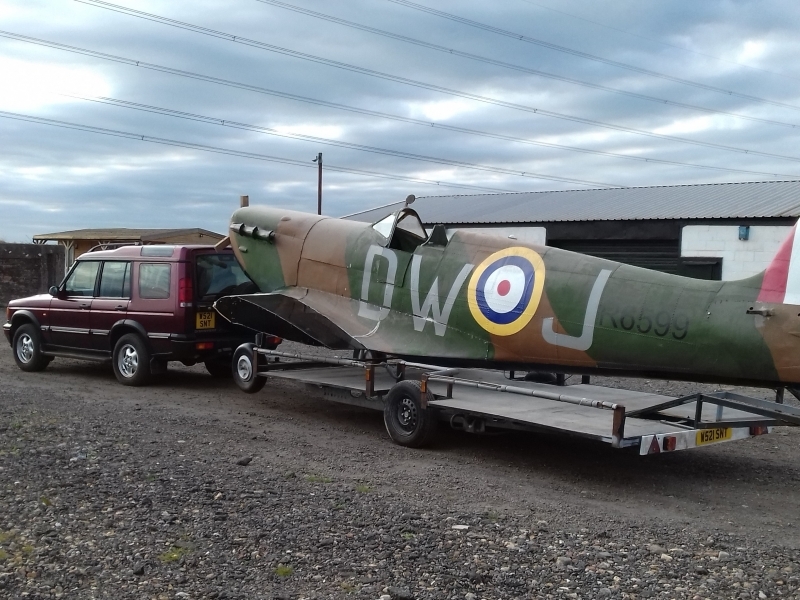 So after the unit had been broken into and a friend hearing my plight a friend very kindly offered the Spitfire a home at Brenzett Aircraft Museum in Kent. Finally the aeroplane has a new, perfect and secure home. 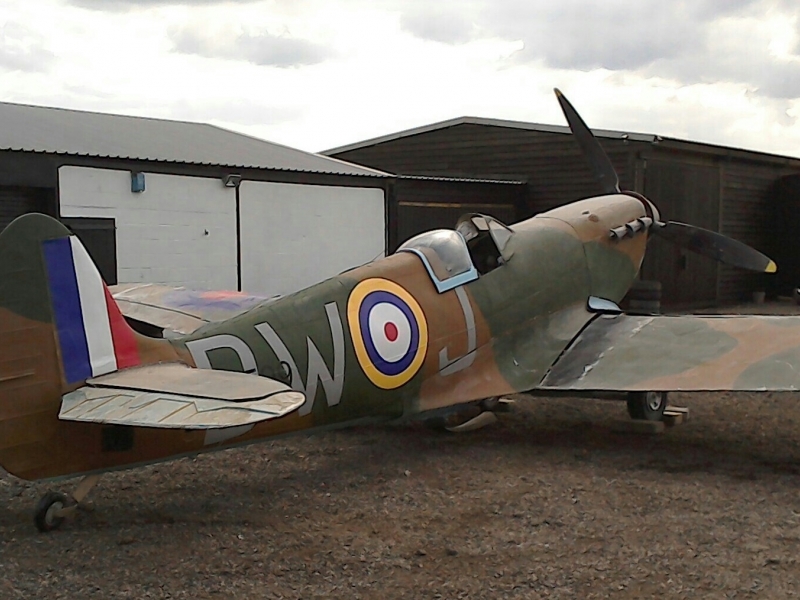 Inevitably of course the replica is now seven years old and typically of course the Spitfire is in need of some tlc. So starting with the undercarriage work has begun on improving the exhibit. 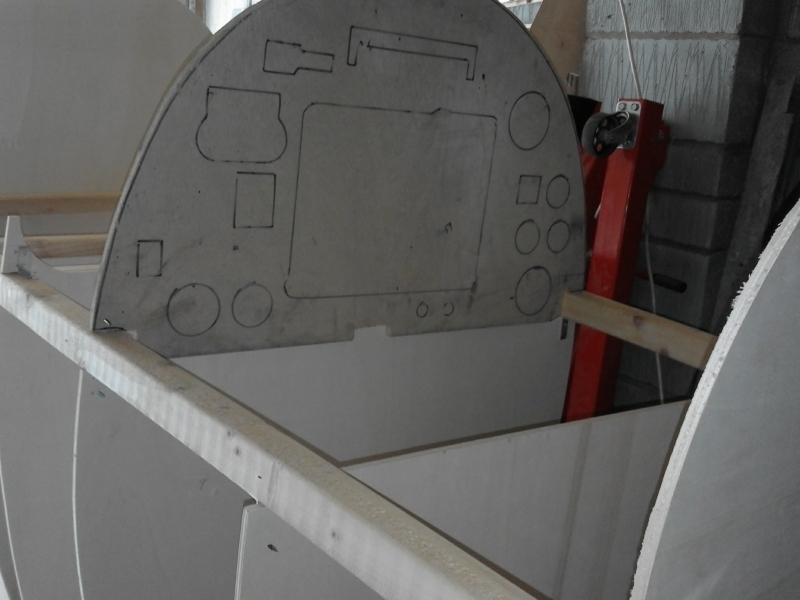 After that it's a revamp of the inner frames and the cockpit to improve it and make it a better exhibit. 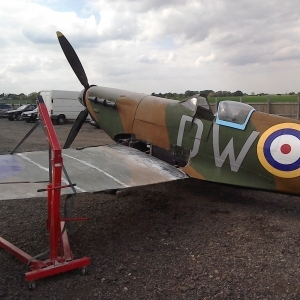 Working on the Spitfire is a challenge though as it's roughly a five hour round trip drive from home to the museum. 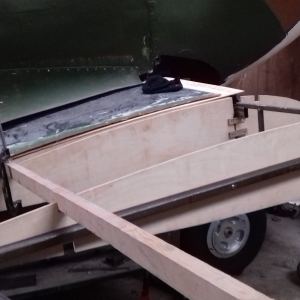 So I do seem to have come full circle as I am now back to where I started with working in my garage and building Spitfire aeroplane parts as part of an enjoyable hobby. 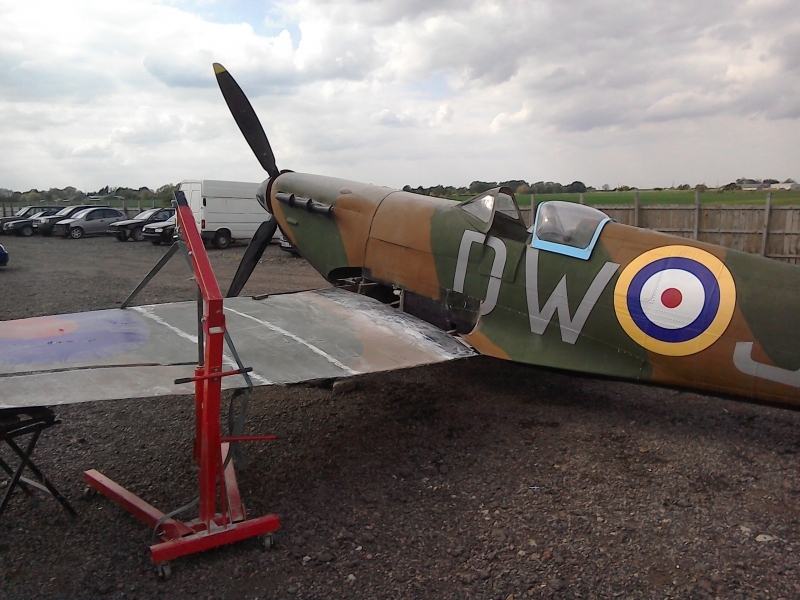 Things have also moved on in that I have started making another Spitfire. One is enough for most people, but I had plenty of wood and other items that I needed to use, or dispose of. 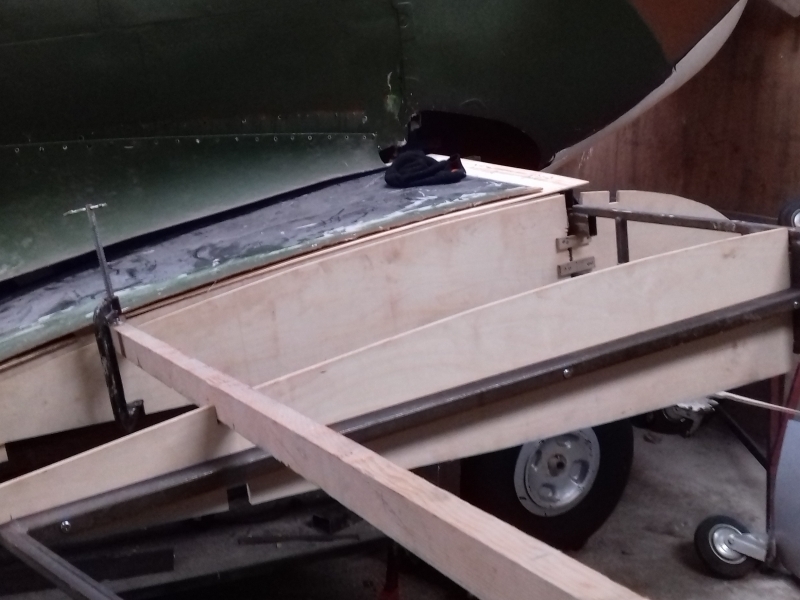 Well I couldn't do that,so while I was making the replacement frames and parts for Spitfire number one, I had enough to have a go at making a second aeroplane. 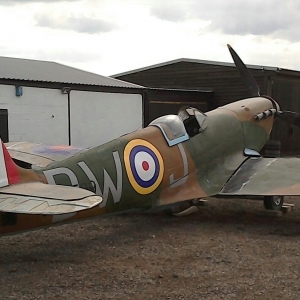 Spitfire number two is very different to the first offering. 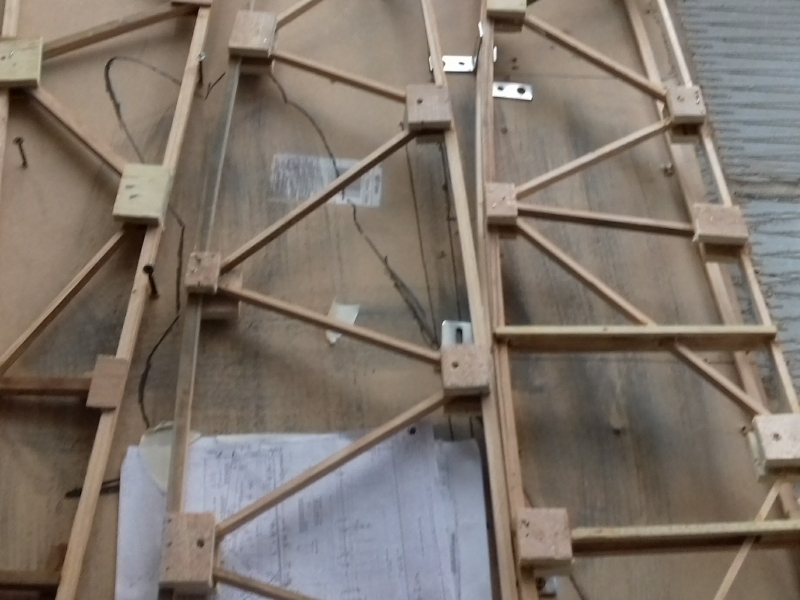 It is still a wooden framed replica (see photos), but I have copied the exact construction of the original aeroplane and dispensed with the metal square frame. I am finally using my books and research.To be different the second Spitfire is a MK16, with a cut back fuselage and new ribs. However, there is no plan, or agenda with that particular model. It will be made when it's made and then worry about what to do with it later. 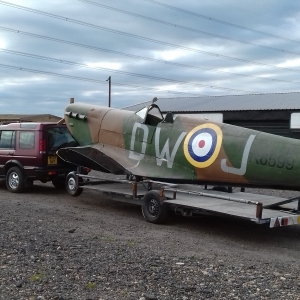 We found displaying Spitfire number one a difficult exercise, with the weight of it and the logistics of moving a large structure. Also my money making scheme failed abysmally, so I am delighted that it now has a new permanent home. 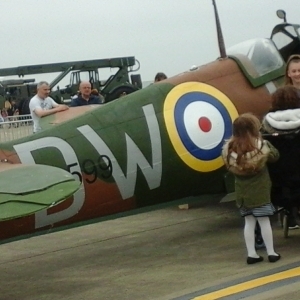 Dylan Jones can build you your own replica Spitfire for display or for a realistic simulator and his email address is dwjspitfire@gmail.com.